Black Panther is Coates’ first comic-book work, but he has an outstanding art team of industry veterans to help him learn the ropes. Artist Brian Stelfreeze has designed a rich technologically advanced environment that still feels grounded in reality, and his character work is detailed, expressive, and dynamic. Colorist Laura Martin elevates the linework with smooth rendering and bold pops of brighter shades, and these preview pages of next week’s Black Panther #2 showcase how well this creative team works together. The last two pages are especially notable, and Stelfreeze and Martin intensify the tension in the script by increasing the contrast in the panel composition and lighting. 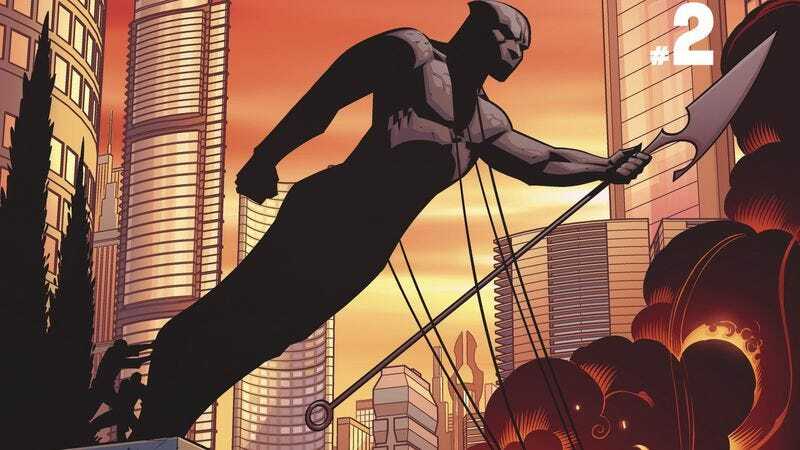 This creative team is working hard to make Black Panther a captivating superhero title full of imagination, intrigue, and intelligence, and hopefully T’Challa’s big screen debut will lead more people to his exceptional comic series.